← The She-type Jag: Luxury carmaker launches 4×4 in bid to attract more women customers. Many storied names in off-roading have changed course in recent years, and now serve better as family haulers because, frankly, that is where the money is. Not to say that unibody vehicles can’t hack it when the pavement ends, but the simple truth is unibody vehicles will never offer the reliability and dependability of a body-on-frame off-roader. That’s something Toyota is banking on. So what are the differences? 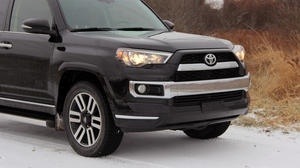 Well the most obvious trait of a body-on-frame vehicle, and the one sure to be noticed first by families cross-shopping these vehicles with their unibody competitors, is body roll, and the 4Runner is no exception. On SR5 and Trail models – the two lower trims – the 4Runner tips like its riding on marshmallows, not offering a smooth ride. 1.The 2014 4Runner starts at $33,680 and our Limited-trim tester costs about $44,260. 2. A 4.0-liter V6 offers 270 hp and 278 lb-ft of torque. 3. 4×4 models are rated for 17 mpg city, 22 mpg highway. 4. The 4Runner is one of the few SUVs to retain body-on-frame construction. The Jeep Grand Cherokee, Nissan Pathfinder, and even the Range Rover now use unibody construction, a move that Toyota refuses to make with the 4Runner, for better and worse. 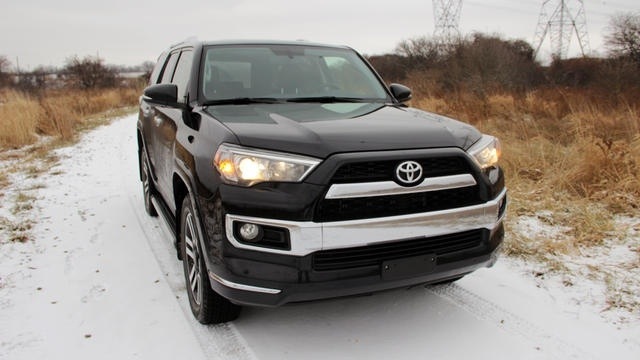 However our tester was outfitted in Limited trim, and Toyota knows that to keep its top-tier buyers happy, the ride has to be smooth, which is why the 4Runner Limited gets special treatment. This model forgoes the proper two-speed transfer case in favor of a center limited slip differential and most importantly, it gets a system Toyota calls X-REAS that automatically adjusts damping force and uses a central control absorber that cross-links the shocks to keep the ride as smooth as possible. It does a fairly good job of keeping the 4Runner Limited flat in the corners, but the body-on-frame dynamics still seep through. Powering the 4Runner exclusively is a 4.0-liter V6 that makes 270 hp and 278 lb-ft of torque, which feels like just enough for this vehicle. Helping when the going gets tough, the motor has a low and flat torque curve, which keeps the grunt under your right foot in all situations. Engine noise can be a little intrusive at high rpms, and the note isn’t all that pleasing. Fuel economy for the four-wheel drive 4Runner is pegged at 17 mpg and 22 mpg on the highway, though our week with the vehicle returned an average of 16 mpg. So, the driving dynamics aren’t exactly soccer mom-friendly, but how does the interior do at kid hauling? First off, Toyota will sell you a 4Runner with seven seats, though our test unit didn’t have them. Everything else about this interior is good. Materials are nice, and the dashboard has a clear, concise layout. Even the plastic that is used doesn’t come off as gaudy and the small bits of wood trim in our Limited model add a premium. Based on its own merits, the innards of this off-roader are comfortable and pleasing, but it doesn’t feel quite as premium as some of its contemporaries, namely the Jeep Grand Cherokee or Nissan Pathfinder. However, the 4Runner does have an aura of ruggedness surrounding it, and the overall feeling of the interior follows suit. The 4Runner is equipped with Toyota’s latest Entune infotainment system, which works well…. for most things. Oddly, the navigation is the only system that doesn’t run seamlessly. It can be slow and the wording on the buttons can be misleading. For example, almost all systems have a “cancel navigation button,” but in the 4Runner, it is marked “delete destination.” On top of that, the touch-screen buttons are small and can be hard to read. That just about covers all of the downsides, which leaves us to discuss the true reason why most will consider a 4Runner in the first place: off-roading. And the 4Runner will not disappoint. Ground clearance totals 9.6-inches when equipped with four-wheel drive, while the approach and departure angles break down to 25 degrees and 24 degrees. Massive 20-inch alloy wheels are fitted on to the Limited 4Runner, shod in mud and snow off-road tires. And these bad boys can grip. On snowy pavement, the full-time four-wheel drive setup in cooperation with the tires won’t lose grip, even when a great deal of throttle is thrown in. Even mid-corner, the rear end never felt as if it wanted to step out. Climbing steep snowy hills didn’t result in wheel spin, either. Where most SUVs would have lost grip and had to quickly redistribute power, the 4Runner setup is ready to tackle obstacles at all times. The high approach and departure angles offer more than enough clearance to tackle most obstacles, but just in case, it’s fitted with skid plates to protect its vitals. There is also a solid rear-axle in the back complete with a mechanical locker. That’s yet another component that compromises the 4Runner on road, but keeps it climbing like a mountain goat when the pavement ends. Best of all, the 4Runner is an ego boost, as the lack of slip and grip transfers the vehicle’s confidence straight into the driver and makes you feel like a tank commander. The 4Runner feels like it can go anywhere. The Limited model features three drive modes: regular 4×4 along with a locked four high and locked four low. 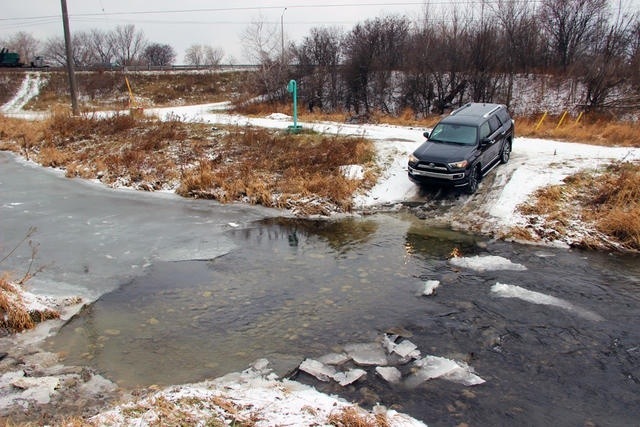 In our time with the 4Runner, we took this SUV through snow and mud, and never once had a need to take the vehicle out of its standard drive mode. Ready and willing from the moment it starts, that’s this vehicle’s mantra. At its base level, the 4Runner is more expensive than most of its rivals, coming in $33,680, compared to the Grand Cherokee’s base price of $29,195. It is also more expensive than the Nissan Pathfinder and Honda Pilot by about the same margin. Even at its top level, the 4Runner calls for a little more cash at $44,260, but if you place your money in a Toyota, you are more likely to see it again. 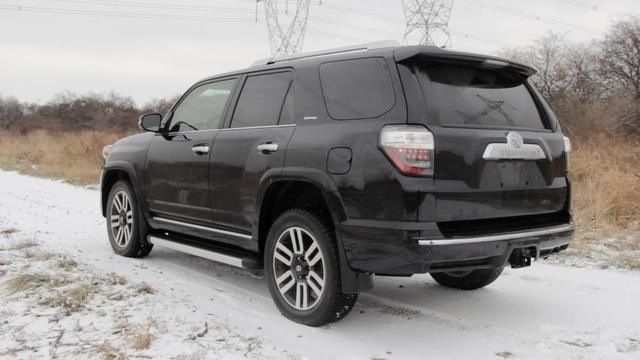 The 4Runner has one of the best resale values in the industry, which should help to justify dropping a few thousand dollars more on this SUV. 4Runner buyers have to be prepared to compromise. The ride and handling of this SUV on the road will simply never compete with its tamer rivals and the interior won’t be quite as nice. 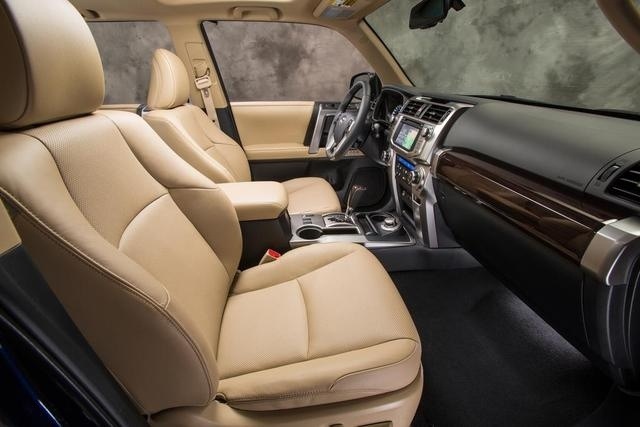 But if you’re looking for more than a highway cruiser and want to go bigger than gravel roads, there is nothing else on the market that offers the same mix of capability and refinement with the space for seven passengers. Combined with the high resale value, and the 4Runner makes a compelling argument to those who want a long-lasting, durable vehicle.